Zhanxi Road is the main area for shoe wholesale market. There are over 15 tall buildings in the area for all different styles, different quality and price range. Many of them are wholesaler and they have inventory on hand so that you can take and go with you. For the first-time businessman, it might be better to try out small quantity with the wholesalers. Some are manufacturer sale office, and they only take orders. Usually, order under 200 pcs for same style will not be acceptable. Of course, exception might apply; it depends on how you could negotiate with the factories. Most of them are both inventory-stored wholesaler and order-taking factories. Description: Global International shoes trade centre is also known as Bu Yun Tian Di Shoes World. It is one of Guangzhou main shoes wholesale centres. Seven floors of modern facilities, high and medium quality shoes and shoes material. Both men’s, women’s and kids’ shoes. Description: Euro Commercial Plaza Shoes City is an established distributing center for shoes in Guangzhou serving all of China. Four floors of wholesale shops with generally quite good quality. Metro:Line 2 or line 5 to Guangzhou railway station, Exit F.
Description: Guangzhou Jin Ma Shoes City is in Guangzhou`s Zhan Xi Road 39#,first and second floor of Jin Feng Building. It is one of the largest wholesale market concentrate in the footwear industry. The business area is over 1,800 square meters. Description: New Continent Footwear Plaza covers an area of 3,000 square meters, and is adjacent to Guangzhou Railway Station, Bus Station, BaiyunAirPort. In 2002, NewContinentFootwearPlaza launches onto the market a new gazing stock: Ya-Yuan Section, which is a part of the whole Plaza aiming at hosting professional dealers of feather materials, shoe-making materials too.The launch of Ya-Yuan Section enriches the variety of products in NewContinentFootwearPlaza. Description: Metropolis Shoes City covers an areaof 22,000 square meters, and has about 800 shops. The market sells Asian-Style shoes mainly for kids and woman with mid-range quality with mid-range price. 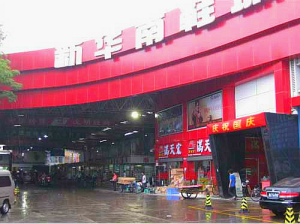 Guangzhou HuaNan Shoes wholesale city is combined with XinHua Nan shoes City and HuaNan shoes city, it’s located at South of Guangzhou DA Dao Road, with area of 100,000 meter square, more 700 booths, it’s the biggest shoes wholesales market in South China. Including child’s shoes, sandales, sneakers, slippers. ect. The producers come from all ovr china. And sale to GuangDong, and to aboard the soutt East Asia, European, Middle East ect.